The following publications give an overview of the ongoing work in the area of Organic Computing. This book is a comprehensive introduction into Organic Computing (OC), presenting systematically the current state-of-the-art in OC. It starts with motivating examples of self-organising, self-adaptive and emergent systems, derives their common characteristics and explains the fundamental ideas for a formal characterisation of such systems. Special emphasis is given to a quantitative treatment of concepts like self-organisation, emergence, autonomy, robustness, and adaptivity. The book shows practical examples of architectures for OC systems and their applications in traffic control, grid computing, sensor networks, robotics, and smart camera systems. The extension of single OC systems into collective systems consisting of social agents based on concepts like trust and reputation is explained. OC makes heavy use of learning and optimisation technologies; a compact overview of these technologies and related approaches to self-organising systems is provided. 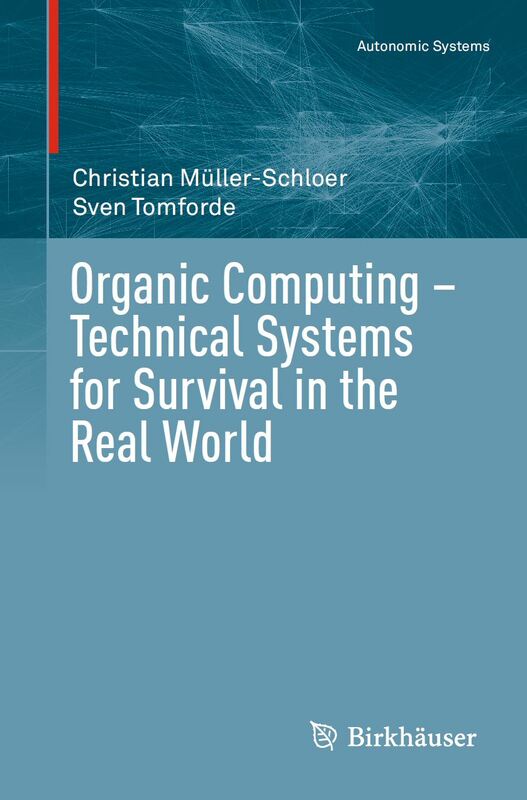 This book summarises the results of a 6-year priority research program (SPP) of the German Research Foundation (DFG) addressing these fundamental challenges in the design of Organic Computing systems. It presents and discusses the theoretical foundations of Organic Computing, basic methods and tools, learning techniques used in this context, architectural patterns and many applications. The final outlook shows that in the mean-time Organic Computing ideas have spawned a variety of promising new projects. This book describes the emerging field of self-organizing, multicore, distributed and real-time embedded systems. Self-organization of both hardware and software can be a key technique to handle the growing complexity of modern computing systems. Distributed systems running hundreds of tasks on dozens of processors, each equipped with multiple cores, requires self-organization principles to ensure efficient and reliable operation. This book addresses various, so-called Self-X features such as self-configuration, self-optimization, self-adaptation, self-healing and self-protection. Organic Computing is a research field emerging around the conviction that problems of organization in complex systems in computer science, telecommunications, neurobiology, molecular biology, ethology, and possibly even sociology can be tackled scientifically in a unified way. From the computer science point of view, the apparent ease in which living systems solve computationally difficult problems makes it inevitable to adopt strategies observed in nature for creating information processing machinery. In this book, the major ideas behind Organic Computing are delineated, together with a sparse sample of computational projects undertaken in this new field. Biological metaphors include evolution, neural networks, gene-regulatory networks, networks of brain modules, hormone system, insect swarms, and ant colonies. Applications are as diverse as system design, optimization, artificial growth, task allocation, clustering, routing, face recognition, and sign language understanding. This book treats the computational use of social concepts as the focal point for the realisation of a novel class of socio-technical systems, comprising smart grids, public display environments, and grid computing. These systems are composed of technical and human constituents that interact with each other in an open environment. Heterogeneity, large scale, and uncertainty in the behaviour of the constituents and the environment are the rule rather than the exception. Ensuring the trustworthiness of such systems allows their technical constituents to interact with each other in a reliable, secure, and predictable way while their human users are able to understand and control them. 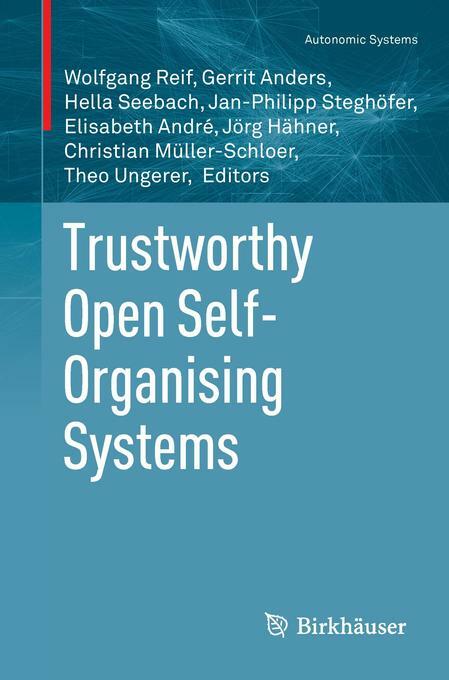 “Trustworthy Open Self-Organising Systems” contains a wealth of knowledge, from trustworthy self-organisation mechanisms, to trust models, methods to measure a user’s trust in a system, a discussion of social concepts beyond trust, and insights into the impact open self-organising systems will have on society.